To access the SnipNotes widget, simply swipe down from the top of the screen to open notification center. Inside the SnipNotes widget, you can quickly save anything on your clipboard, your current location and quickly access the main app. SnipNotes integrates into the share menu of many apps. This way you can e.g. save a website URL in Safari or an address from Maps. You can enter your own text and add images from camera or your photo library. 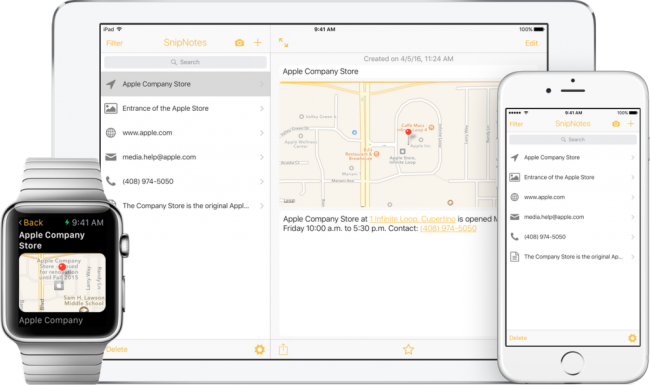 SnipNotes for Apple Watch allows you to dictate notes as well as save your current location. Here’s an App Store link for SnipNotes. 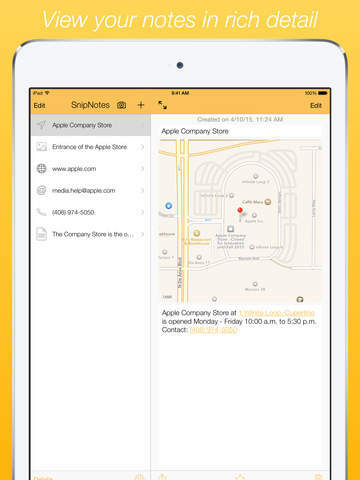 Compatible with iOS 8.2 or later, SnipNotes for iOS is an universal app that works with iPhone, iPad, iPod Touch and Apple Watch. It is a free app, and for $1.99 you can upgrade to unlock the full version that gives you unlimited notes. I’m the developer of SnipNotes. Thanks for the review! SnipNotes 2.0 will be a free upgrade for existing users, so if you buy the in-app purchase now you will get it for free.